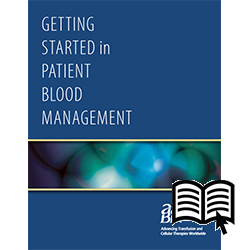 This publication is a primer that explains the rationale for limiting transfusion, reviews the five major concepts in patient blood management, and describes how facilities of any size can take positive first steps toward program implementation. The download is complimentary for AABB members. After reviewing the rationale for limiting transfusion, this primer thoroughly discusses the five major concepts in patient blood management: 1) limiting blood loss through phlebotomy for testing, 2) optimizing patient hemoglobin levels, 3) using autologous donation and intraoperative blood recovery techniques, 4) minimizing perioperative blood loss, and 5) making evidence-based hemotherapy decisions. Also included are practical suggestions for taking initial positive steps toward program implementation, sample forms and reports, and helpful print and online resources. The download is complimentary for AABB members.